With the excitement surrounding Senior Day and the opportunity to match the program’s best start in history, the No. 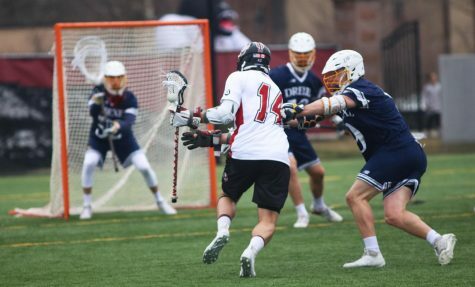 2 Massachusetts men’s lacrosse team used a 10-1 second half to cruise past No. 19 Towson, 14-3, on Saturday afternoon at Garber Field. With the win, UMass (10-0, 3-0 Colonial Athletic Association) is off to its best start since 2001 when the Minutemen also started 10-0. 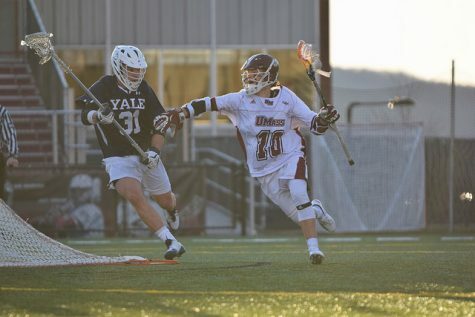 A win didn’t seem like an easy task early on, as UMass held just a two-goal advantage heading into the final four seconds of the second quarter. That’s when momentum exchanged hands in the matter of seconds. The Tigers (7-4, 2-1 CAA) appeared to be headed into halftime with just a one-goal deficit after Andrew Hodgson ripped a shot past Tim McCormack with 3.9 seconds remaining in the second period to cut UMass’ lead to 3-2. However, their momentum was short-lived as Anthony Toresco won the ensuing faceoff and found Kyle Smith in front of the net, who pivoted and fired a turnaround shot past Towson goalie Andrew Wascavage before the horn sounded. The stunned Tigers sideline protested the goal, but it was upheld as UMass seized momentum and didn’t look back. Senior Tom Celentani and the Minutemen defense were stingy once again, holding the second-best scoring offense in the CAA to three goals. 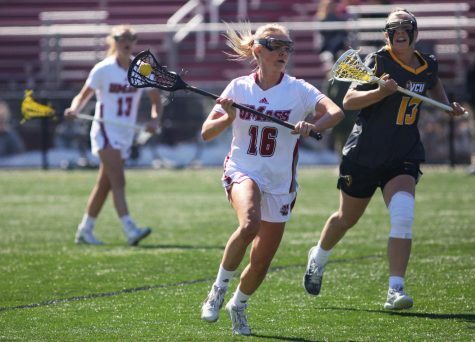 UMass – the top scoring attack in the conference – outshot its visitors 55-24 on the afternoon, including a 34-12 advantage in the second half. Celentani says that going against the Minutemen’s high-powered attack in practice has helped them prepare for game day. 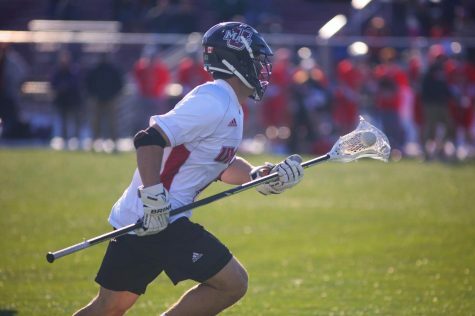 McCormack surrendered just three goals while stoning 10 shots in his Senior Day performance. His dominating effort follows his shutout last time out against Saint Joseph’s. Smith led the charge with four goals and two assists for his season-high six-point day. Colin Fleming added a hat trick and senior Art Kell tallied five points of his own. Both sides got off to a slow start with the first 6:49 going by scoreless. The Minutemen got on the board first as Kell found Will Manny on a cross-net pass and Manny batted the ball in for the goal. Fleming made it 2-0 at the 2:24 mark of the first and Manny netted his second goal with 5:29 left in the second to give UMass a 3-0 advantage. Towson cut the deficit to 3-2 with back-to-back goals, but Smith’s goal before the half captured momentum for the home team, something the Tigers ultimately couldn’t recover from. 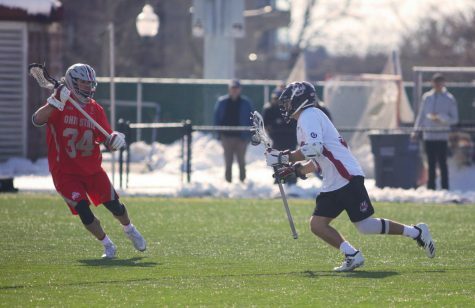 The Minutemen carried their energy into the third quarter with three unanswered goals. Greg Rushing deposited his first goal of the season on a one-man effort. 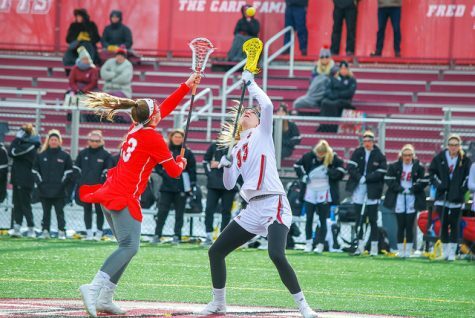 The senior caused a Towson turnover, picked up the groundball and went coast-to-coast before beating Wascavage for the goal. Rushing said scoring on Senior Day was a special moment. 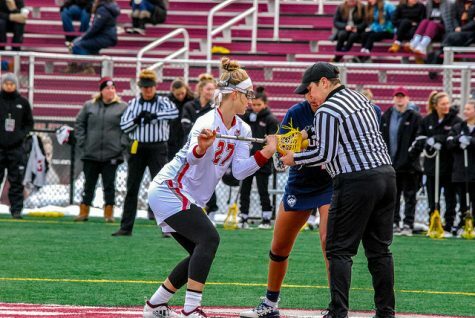 UMass held an 8-3 lead heading into the fourth quarter, but coach Greg Cannella knew his team had to keep its foot on the gas pedal to hold off a Tigers squad that pulled off impressive fourth quarter comebacks in their previous two affairs. “Towson’s done a great job all year, particularly in their last two games, in coming back and … we talked about [allowing] no runs, try to eliminate that from happening and fortunately our guys kept playing,” said Cannella. 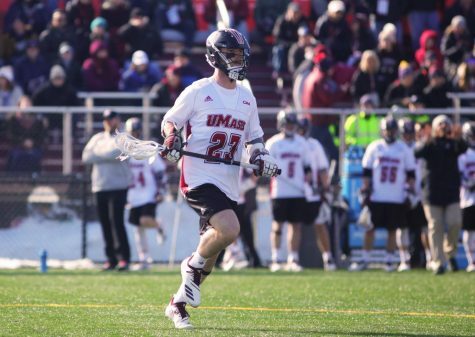 The Minutemen eliminated any chance of similar heroics, as Smith and Kell scored within six seconds of each other to extend UMass’ lead to 10-3 with 10 minutes remaining. 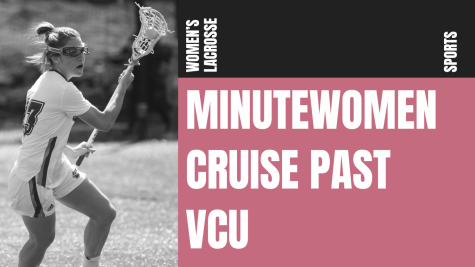 When it was all over, the Minutemen outscored Towson 6-0 in the fourth quarter. Although the team has its sights on bigger goals, Celentani acknowledged the 10-0 start as a special achievement. 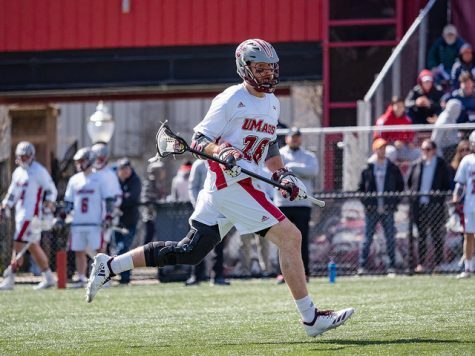 UMass is away from Garber Field for its final three games of the regular season, starting with a trip to neutral-site Bethpage High School in New York to play CAA foe Drexel.